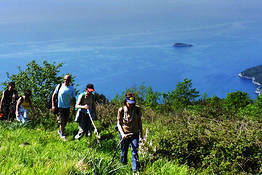 Concerts, artistic treasures, and fabulous cliffside gardens overlooking the sea. 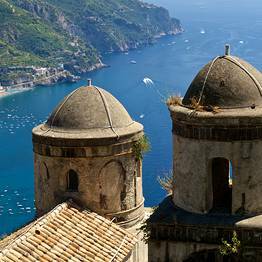 Unlike the majority of towns on the Amalfi Coast, Ravello is not located by the sea. To get to this beautiful cliff top town you'll need to leave the SS163 between Amalfi and Minori, and head in and upland for about 3 kilometer. Alternatively, you can reach Ravello by making your way down the Chiunzi pass (which you can access from the A3 motorway, exiting at Angri). 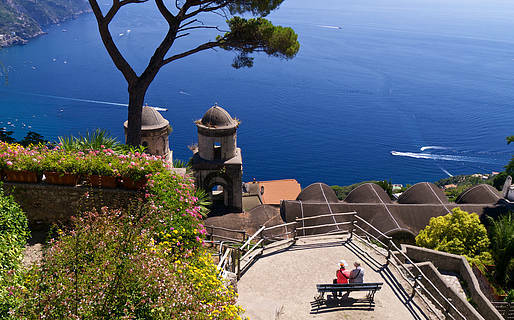 The Sita coach company operates a bus service to Ravello from Amalfi. 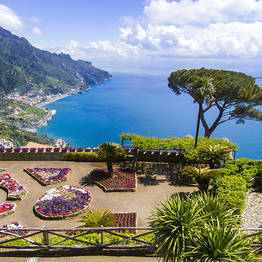 Beauty comes naturally to Ravello, just like its love of art and music. 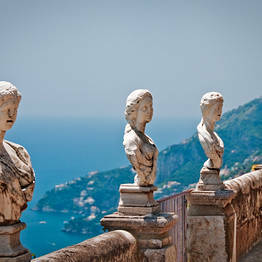 For centuries, the irresistible allure of Ravello's stately villas and cliff edge gardens have been attracting the world's greatest artists to the tiny town perched high above the bay of Maiori: musicians such as Wagner, Grieg, Rostropovich, Toscanini, Bernstein; painters like Escher, Turner and Mirò; and writers the caliber of D.H Lawrence, Forster and Virginia Wolf all spent time here. 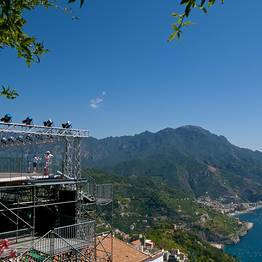 Now, a well established cultural hotspot, today Ravello hosts high profile events such as the Ravello Festival and the Chamber Music Festival, which is organized by the Ravello Concert Society. 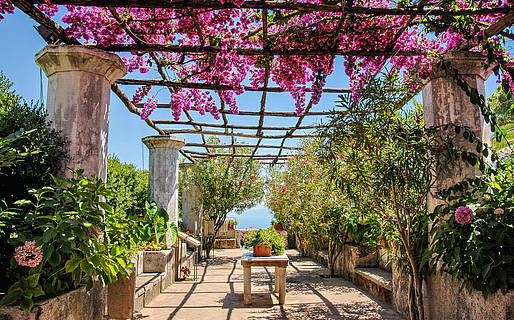 Villa Cimbrone's Terrace of Infinity. The terraces of Villa Rufolo. 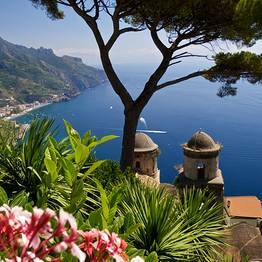 Wonderfully aristocratic, devastatingly beautiful, Ravello patiently awaits the traveler who, from the Amalfi Coast's seaside fishing villages decides to make his way up to the town, perched on a great spur of rock, some 350meters above the sea. Constructed on the site of a settlement believed to have been built by a Roman colony fleeing from the barbarian invasions; in the 9th century Ravello became the elected refuge of a group of noble families from Amalfi, who had rebelled against the authority of the Doge. Ravello soon prospered thanks to the production of the town's "Celendra" wool and, in the 11th century, attempted to dissolve its ties with the Maritime Republic of Amalfi, by nominating its own Duke. 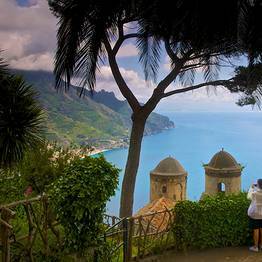 The town's decline coincided with the Norman conquest and over the ensuing centuries the population of Ravello, which in 1200 had been circa 36.000, diminished to such an extent that in 1800 the town was aggregated with the diocese of Amalfi. 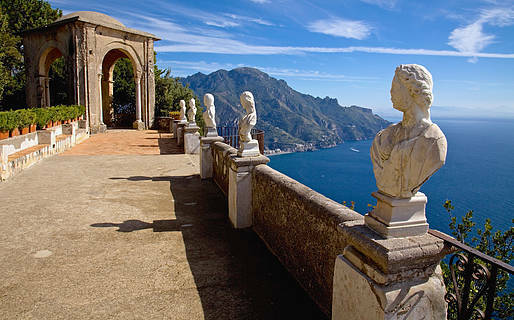 However drastic, its change in fortunes failed to impair the town's charm and, if anything, conserved it, making Ravello the chosen destination of inspiration-seeking intellectuals, artists, and celebrities from every corner of the globe. The "Duomo", erected in 1086, dominates Piazza del Vescovado with its splendid, triple arched marble portal and magnificent bronze door created in 1179 by Parisano da Trani. The cathedral's museum is more than worthy of a visit if only to admire the splendid marble bust of Sigligaida Rufolo, widely considered to be one of the most beautiful works of 13th century art. 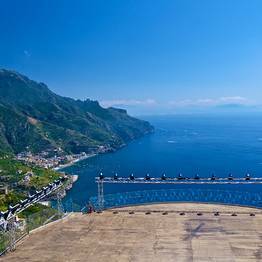 A cultural bridge between the past and future, Ravello provides the setting for the controversial Auditorium by Oscar Niemeyer, an international design legend. 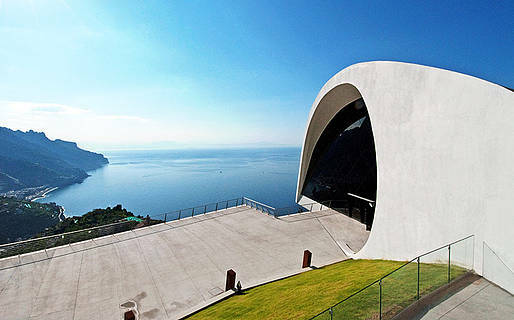 A powerful work of modern architecture bang in the heart of a UNESCO world heritage site, the 400 seat auditorium has been likened to a sheet of white paper blowing in the wind. The tower which faces on to Piazza del Vescovado originally served as watch tower for Villa Rufolo, one of the architectural masterpieces which has contributed to Ravello's worldwide fame. The villa was constructed in the latter half of the 13th century by the powerful Rufolo family. Both Moorish and Norman influences can be seen in the towers and cloisters, the latter characterized by a double order of loggias and pointed arches. The grounds of the villa are as famous as the building itself. 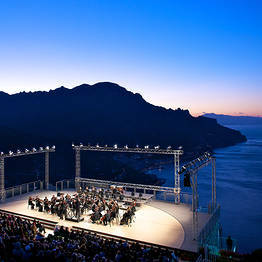 The magnificent cliff edge terrace, perched directly above the sea, is the venue for Ravello's annual Wagner Festival. Wagner stayed in Villa Rufolo in 1880, whilst composing his Pasifal, and was so enamored by the place that he declared "the magic garden of Klingsor has been found". Villa Cimbrone, is the visionary work of Lord William Beckett who, in 1904, purchased what was then a long abandoned farmhouse and transformed it into a splendid residence , using an eclectic mix of architectural styles and eras, archeological relics and souvenirs of his extensive travels. The luxuriant garden is home to many rare botanic species, but also statues, fountains, temples and artificial grottos, all of which reflect the passion for antiquity so in vogue at the time of its construction. The paths which traverse the garden culminate in the Infinity Terrace" and one of the most beautiful views in the whole world. Church of San Giovanni del Toro. 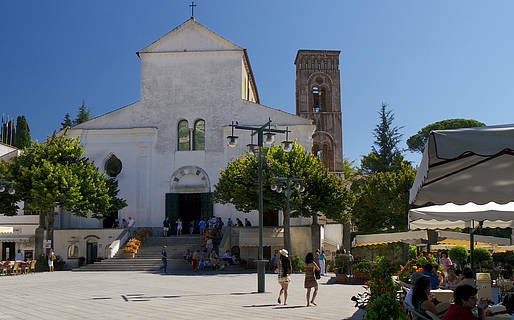 Church of Santa Maria a Gradillo. 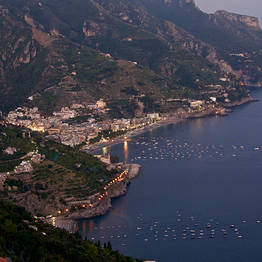 Traditional dishes: Locanda Moresca, and excellent elegant and modern restaurant in Ravello's picturesque piazza. Gourmet dishes: Rossellinis (inside Hotel Palazzo Avino), a Michelin-starred restaurant with a sea view terrace that is one of the most romantic on the Amalfi Coast.